2019, March 3. Harlingen reconstructed. We completed our file on Harlingen 1945. This small Dutch coastal town had after WW2 a varied and interesting war graves plot, not visible today. A gruesome effect of war hit Harlingen two months after the Dunkirk evacuation, when in weekend of 26/27 July 1940 a group of more than 100 dead soldiers washed ashore on the coast here. Thirty men were buried in Haringen. Among them a German pilot, British RAF and Royal Navy personnel, but most were French sailors and French Army troops from the minesweeper Emile Deschamps, the last ship that left Dunkerque. In the early morning of June 4, it hit a mine only a few miles off the English coast northeast of Ramsgate and sank in seconds. Nous avons terminé notre fichier sur Harlingen 1945. Cette petite ville côtière néerlandaise avait après WW2, une parcelle de tombes de guerre variés et intéressants, pas visible aujourd'hui. Un effet horrible de la guerre a frappé Harlingen, deux mois après l’évacuation de Dunkerque, en fin de semaine du 26/27 juillet 1940, un groupe de plus de 100 soldats morts échoué sur la côte ici. Trente hommes furent enterrés dans Haringen. Parmi eux, un pilote allemand, le personnel britannique RAF et la Royal Navy, mais la plupart était des marins Français et troupes de l’armée Français du dragueur de mines Emile Deschamps, le dernier navire qui quitte Dunkerque. Tôt le matin du 4 juin, il a touché une mine seulement quelques miles des côtes anglaises au nord-est de Ramsgate et coulé en quelques secondes. Fiche/file Harlingen. 2018, November 28. Recovery Program WW2 Aircraft Wrecks by Dutch Government announced. The Dutch Government will budget 15 million Euro to speed up the recovery of war planes holding missing crew that are still in soft ground in the Netherlands nearly 75 years after WW2. This was welcome news for everybody involved and families who want their relatives properly buried. A number of 30 to 50 aircraft is mentioned in the media. Expected is that this figure in 2019 will become much lower once experts have assessed each case for its feasibility for succesful recovery. In most cases there is not much left to find because bomb loads exploded in the air or on impact and previous recoveries. This leaves mostly aircraft wrecks that have been reported in inland water (Lake IJsselmeer) and excavating known field graves that usually have a commemorating monument on it. The challenge for the Dutch Army and Airforce recovery units will be locating and salvage sections of aircraft with MIA crew that must be near a crash site, but were never discovered. By careful evaluation of each case and carrying out only viable recoveries one at a time, budget can be saved for recoveries in nearby future that no doubt will arise because of upcoming building projects. We expect that 75 aircraft wreck sites will be encountered when all sections of Lake IJssel-/Markermeer (Old Zuyder Sea) will be developed. Important candidate for recovery: Stirling BK710, 149 Sqn, 25/26 May 1943. Lake IJsselmeer, 6km SE Marken, 1,5 km off harbour Blocq van Kuffeler, Almere (inside boundary Almere). End Dec. 2008 (not boating season), a sailing yacht made a daring trip over the Lake. As often in such cases they got in trouble (engine failure). The waves pushed the boat towards the dike between Almere - Lelystad. It was eminent it would be smashed on the stones of the Oostvaarders-dike. Anchor was dropped, did not hold and a SOS was made, Marken lifeboat was sent underway. When the lifeboat had situation under control and tried to raise the yacht's anchor, a large piece of metal came up also. Investigation a day later by the notified ARG 40-45 foundation showed that it was wreckage of a WW2 Stirling bomber. Later a painted 'BK710' on a metal sheet could be read with help of X-Ray. Stirling BK710, pilot Sgt. Jack Uden, was lost on return from bombing Düsseldorf, thought to be lost in the Northsea. Only tail gunner Sgt. Charles J. Percival was found back. He was buried four weeks after the crash (20 june 1943) in Heligoland Island (Helgoland), Northsea- German Bight, northwest of Bremerhaven. This is consistent with the wind and time elapse. His body can have floated north and passed the wide dewatering sluices at Kornwerderzand after which the standard current brings a body further east. Another such similar case is known. On 20 October 1946 Sgt. Percival was reburied in Hamburg Ohlsdorf. The other six crew are missing (MIA). Based on the small and very damaged debris found, the crash must have been nose-first and very hard. Front of the aircraft disintegrated on impact and drove hard into the muddy bottom. Depth is only 4 meters. It is expected human remains are there as parachute-harnass gear has been found in dive reconnaissance. The Germans can have salvaged larger bomber parts, they were quite active with aircraft recoveries in this area. Image below shows they recover a Stirling nearby second half 1942. During and after the war the spot was marked by fishermen. They lost trawl nets there and reported location to the Dutch Government. What was recovered by the Germans is unknown. Recovered by the Dutch after the war was the tail section, but it could not be identified. Location for the tail received no. 75 on the map (see above). It is a bit closer to Düsseldorf as where the cockit section debris was found. Apparently the tail had broken off in the crash, it did not went into the mud. Only tail gunner Sgt. Percival had time to jump or his body came clear of the tail section. De Nederlandse staat zal 15 miljoen Euro vrijmaken voor versnelde berging van vliegtuigen met vermiste bemanning die zich bijna 75 jaar na het einde van de 2de WO nog steeds in de bodem bevinden. Dit was welkom nieuws voor iedereen die zich hiermee bezighoudt en families die hun geliefden behoorlijk begraven willen zien. Een aantal van 30 tot 50 vliegtuigen werd in de media genoemd. Verwachting is dat dit getal veel lager zal uitvallen wanneer specialisten elk geval hebben beoordeeld en de haalbaarheid van een succesvolle berging zal zijn getoetst. In meeste gevallen zal niet veel te vinden zijn omdat bomlading in de lucht of bij de crash is ontploft, brand en eerdere bergingen. Blijft over voornamelijk vliegtuigwrakken die gerapporteerd zijn in binnenwater (IJsselmeer) en het uitgraven van bekende veldgraven die in meeste gevallen gemarkeerd worden door een monument. De uitdaging voor bergingseenheden van de Nederlandse krijgsmacht zal het lokaliseren en bergen zijn van vliegtuigdelen incl. vermisten die in het verleden niet eerder op de crashsite ontdekt zijn. Door zorgvuldige evaluatie, uitvoering van alleen haalbare bergingen en stapsgewijs werken kan budget beschikbaar blijven voor toekomstige vondsten die zeker zullen komen. Wij verwachten dat 75 vliegtuigwraklokaties aangetroffen worden wanneer alle delen van het IJsselmeer/Markermeer in ontwikkeling gaan. Dutch provinces where we do not expect recoveries: Flevoland/NOP, Groningen, Zuid-Holland, Zeeland, Drenthe, Utrecht. Zuidoostbeemster. Zuiderweg 41 (private land). Marked field grave. Blenheim R3892, 19 August 1940. Nieuwe Niedorp. Kanaalweg 5/Westerweg (private land). Marked field grave. Wellington T2990 (Czech crew, RAF/Czech 311 Squadron), 23 June 1941. Echt-Susteren, Abdij Lilbosch. Between Roermond and Sittard, near German border. Stirling W7630, 10/11 September 1942. Meijel. Between Weert and Venlo. Road N275 Nederweert - Maasbree (N275 x N279). Roggelsedijk 19. Lancaster W4949, 14/15 June 1943. Mariënheem, road Raalte to Hellendoorn. Bloemkampseweg no. 4. Lancaster ED584, 12/13 June 1943. Follega, northeast of Lemmer. Straatweg 31, behind Tramdijk. Lancaster JA853, 16/17 December 1943. Speers, northeast of Sneek. Speersterdijk x N354. Marked field grave. Halifax W7714, 29/30 June 1942 (6 MIA in soft ground). Asten (de Peel), between Eindhoven and Venlo. End of Veluwsedijk, today Kokmeeuwenweg. Halifax NA197 (French crew), 7 February 1945. Between Zutphen and Deventer, southwest of Gorssel, Lindeboomweg. Typhoon MN582, pilot F/Sgt. W. Hurrell, 26 September 1944. Angeren, south of Arnhem. Community Lingerwaard. Close to German border. FW190 (410005), German pilot, possible Oblt. Karl Becker, 30 July 1943. Another long waiting candidate for recovery: Lancaster ED603, 83 Sqn, 12/13 June 1943, F/Lt. Eric Tilbury, Lake IJsselmeer north, a few km S of Breezandhaven. Discovered 1996. Image below shows situation today on the white sand seabed. Lancaster lays belly up, nose in sand, fuselage to the back slightly running upwards, tail is broken off. Depth 6 meter. This recovery can be realized cost-effective by sawing off the wings at inside of the inside engines. This leaves the wing fuel tanks intact. The Rolls Royce Packard Merlin 28 engines are already taken off. Loosening the sand under the wreck and hoisting the centre section up. Missing crew members are expected behind the cockpit, the floor with bomb racks is above them. Recovery operation like this is also within the capability of the Dutch Army Engineer Divers. Aircraft was just inside the jurisdiction of village Makkum (Wonseradeel), but it did not set recovery in motion. Today location is inside community-boundry of Sudwest-Fryslând (Sneek). Crew Lancaster ED603. Highly skilled and at the time specially selected pathfinder crew, all officers. Pilot Flight Lieutenant Eric A. Tilbury (service number 127147) washed up and buried Stavoren 22 June 1943. Navigator P/O Harold E. Howsam (146295) and bomb aimer P/O Arthur G. Fletcher (J/17802, Canada) both buried in Workum 21 and 23 June 1943. Tail gunner F/O Gordon R. Sugar (127055) buried Hindeloopen 22 June 1943. The three officers with the lowest service number (longest in service) and all three holder of the DFM (Distinguished Flying Medal) are missing in action: flight engineer P/O Arthur B. Smart, DFM (51914), wireless operator P/O Raymond E. Moore, DFM (52074) and mid upper gunner P/O Charles F.J. Sprack, DFM, age 24 (51543). 2018, March 15. In memoriam, 1Lt. Hubert R. Cripe. A few weeks ago, we received a delayed Christmas card of Mr. Hubert Cripe, mentioning that he had been sick and therefore was not able to sent his card on time. Today we received the message that Mr. Cripe passed away February 20 2018 peacefully in his house in Astoria, Illinois, age 97. Our great friend who parachuted into our Lake IJsselmeer (Old Zuyder Sea) in 1944, was a symbol to us of the USAAF daylight raids into Germany 1943-1945. On February 23 2018, also the fisherman involved died in Volendam, NL. In honor of Mr. Hubert Cripe, his crew and the fishermen participated in the rescue 6 March 1944, we have updated the file of B-24 Liberator 42-52226. 2017, November 25. Background of Sgt. Vincent Sature, buried 1941 Texel Island, finally known. Years long research in Canada reveal he is Polish WW2 volunteer, born with name Vincent Korzydlowski. On Friday December 1, 2017 a church service will be held for Vincent in Windsor, Canada. His name is there on the RCAF memorial in the city's waterfront. Church is the Our Lady of Mount Carmel Catholic Church, 4401, Mt. Royal Drive, Windsor. Below is a letter the RCAF sent in 1946 to Vincent's uncle in Detroit (opposite to Windsor). Father and mother in Poland could not be reached. Up to today, no relatives in Poland were found. Letter of his volunteering for air gunner in the RCAF Page 1. Page 2. Letter of the RCAF to Vincent's uncle in the US. 2017, November 20. Recovery coordinates found of missing B-17G 42-102565 'The Ugly Duckling', crew Rolfe, 398 Bomb Group, 26 Nov. 1944. 2017, September 6. Amsterdam. Burial crew Polish Wellington R1322. Photo right. Begin of ceremony. Polish airforce and honour guard at attention at the open grave, behind the first row of headstones. Below: Polish rifle salute guard 20 men strong. On the right, Dutch Army band. Polish, Dutch and British National anthems were played. Speech by Polish authorities, flanked by Polish chaplain and priest of the Polish church in Amsterdam. The six men on the right are personnel of the Amsterdam undertaker and Amsterdam City New Eastern Cemetery personnel including the Consul of Dutch War Graves Commission. Coffin with Polish flag is in position over grave Plot 69, row B, grave 2. At front row is visible headstone of Polish Spitfire pilot Jan Wierchowicz. In the middle is the headstone (with photo and Polish ribbon) of pilot of Wellington R1322, Sgt. Jan Dorman. Below. Flag is taken from coffin, folded in special way and brought to the highest Polish officer present in the cemetery. Below. Polish guard begins making ready for firing three salute salvos. Dutch Army sergeants involved in recovery of wreck Wellington R1322 and Polish Air Force staff. Chosen is interment in grave 69.B.2. Here was room to place a headstone in between the 2nd stone (Sgt. Everest) and the 4th stone from left (F/O William Peers). The grave involved is the old grave no. 80 in which in 1944 four American airmen were buried, exhumed 1945. Post war RAF Sgt. Albert Everest was reburied in the empty American grave. He came from the cleared plot 72, killed 13 November 1940. He still rests in this grave, bottom coffin. His stone is the 2nd headstone. The coffin with F/O Maciej Socharski and Sgt. Sikorski is added onto the coffin of Sgt. Everest. Most graves on this row have two to four coffins in each grave. Below. Moving moment. The Polish General handed over the folded Polish flag that was over the coffin, to the son (age 78) of F/O Socharski. He was 2 years old when his father was shot down in Wellington R1322. His mother was member of Polish resistance and was in 1943 arrested and moved to Auschwitz-Birkenau. Mr. Malcolm Mason MBE of the RAF Association, Dutch Air Force General in blue uniform and British Consulate Mr. Johnson in background are all respectfully silent. Photo right. Major Arie Kappert laid flowers and stands at the attention in civilian clothes. He led the recovery of Wellington R1322 just before his retirement from the Dutch Air Force. Left the experienced men and woman of the Dutch Army Recovery and (human remains) Identification Unit. They did an excellent job in the recovery of Wellington R1322. Maybe got to little official attention during the funeral ceremony: in the process of identifying the remains of F/O Socharski and Sgt. Sikorski, it could be established that the unknown Polish airman in the begin of plot 69 (nearest to the Cross of Sacrifice) was the missing Sgt. Stanislaw Pisarski, the front turret gunner of Wellington R1322. His grave stone was changed in a new one with his name. Not MIA (Missing In Action) anymore after 76 years... This to joy of his direct relative, Mr. Jakub Bialowas. 2017, June 26. Amsterdam. Robert Leo Hage. In an intimate and beautiful event, RAF Pilot Officer Robert Leo Hage was honoured in a joint American-British ceremony. Robert 'Bob' Hage was an American Volunteer from Montana who entered the British Airforce before Pearl Harbor. After he was shot down and killed over Lake IJsselmeer in Wellington bomber X9786 night 13/14 Sept. 1942, he lay buried non-identified in Amsterdam for 6 years. He was only child. His parents could not speak about his death and could not visit his grave when he was finally identified in 1949. On the gravestone was a mistake. Recently it transpired that three medals still lay in London, waiting. In the ceremony last Monday, the new headstone was rededicated. The British medals were given to the family and will be donated to the Fillmore County Historical Society in southeastern Minnesota, where Robert Leo's parents and other family were born and are buried. At the graves of the other five American volunteer pilots in Amsterdam also flowers were present, laid there on US Memorial Day. 2017, June 25. Pratt & Whitney R-1380 Twin Wasps back over the Lake. For us a flight with a 1941-build Consolidated Catalina PBY seaplane, was a tribute to the Consolidated B-24 Liberator and Vickers Wellington Mk. IV (Polish and Australian squadrons) that passed over our Lake day (B-24) and night (Wellington) in the period 1941-1945. Both having the same engines as the Catalina: the 14-cylinder (double row) radial Pratt & Whitney R-1380 Twin Wasp. Beautifull sound and experience. We crossed the Lake east to west, as coming back from a mission over Germany 1943. Short impression (25 seconds): https://www.youtube.com/watch?v=S-7dJ_g0nq0 <- increase sound level! This Catalina PBY was build 1941 and patrolled the North-Atlantic waters. It was based on Iceland and its American crew sunk three German U-boats with bombs. The Dutch Navy also flew with Catalinas before and in WW2. In 1996, a Dutch Historical Society managed to buy this aircraft. It was named 'Karel Doorman' after the Dutch naval war hero and fully restored. 2017, June 21. Wallace Emmert died at 101. Pilot of the in our region well-known B-17G 42-37751 Lt. Wallace E. Emmert died in his hometown age 101. War hero, may he rest in peace. 2017, May 2-7. Remains found in Polish Wellington R1322 (08/09 May 1941) identified. Dutch military recoverers believe that bone fragments found are of the two men in the compartment behind the pilot; the missing wireless (radio) operator corporal Henryk Sikorski and navigator Flying Officer Maciej Socharski. The leg (bone) of a third man was found, which belongs to the unknown Polish airman in grave 69/E/21 in Amsterdam which identify him by deduction as front gunner Stanislaw Pisarski. This was communicated to the Polish Embassy in The Hague. Advised is replacement of the stone in Amsterdam for Pisarski and burial of Sikorski and Socharski. In 2012 we discovered that together with pilot Jan Dorman and co-pilot Zdzislaw Gwozdz, a third unknown airman (also from the water) was buried next to them in grave 72/34. This was on 20 May 1941, Amsterdam. The unknown was post war (1946) exhumed, examined and moved to grave 69/E/21. There he received a Polish headstone with engraved 'Polish airman, 20 May 1941, known unto God' (photo stone). However, it was clear to us he had a connection with Dorman and Wellington R1322 and had to be one of the three missing crewmembers. When wreck parts of Wellington R1322 were discovered in the Lake in 2014, our knowledge on grave 72/34-69/E/21 became relevant and we put it on this website and send emails out. On the first day of the recovery by the Dutch airforce on 19 August 2016, parts (bones) of a right leg were found front of the wreck. The English exhumation report of 11 October 1946 for grave 72/34-69/E/21 was consulted recently. The report stated in the grave was a Polish airman, Air Gunner, Sgt. stripes on shoulder, no 'Sparks' wireless badge on right arm, without right leg... Deduction then lead to the front gunner of Wellington R1322, Sgt. Stanislaw Pisarksi, since tail gunner Ludwik Karcz is buried in Amersfoort (Leusden-Zuid) and Sgt. Henryk Sikorski was in the radio room. Pisarki and Sikorski were both trained Air Gunner/Wireless (radio) Operators. Dutch Army & recovery archeologists believe Sgt. Henryk F. Sikorski was the acting wireless (radio) operator, probably with Sparks badge. On Sikorski's very early in war personal name card (Polish Embassy in England in WW2) now in Hayes (files MOD) is mentioned at Remarks "RADIO & TELEG. MECH." (or "MSCH."). Sgt. Stanislaw Pisarski is presumed front gunner and had probably no Sparks badge on his uniform and was therefore front gunner, the man who was buried with pilot & co-pilot. It makes sense that the three men in front of the aircraft were thrown clear when the cockpit smashed, and the two men in the radio- and navigation section were closed in (Sikorski and Socharski). 08/09 May 2017: The Tadeusz and Anna Krzystek list (listakrzystka.pl), a recent project and website with the names of the 17.000 Polish that served in the Polish Air Force in England, confirms Stanislaw Pisarski, 781063, Sgt/Plutonowy had as specialty: Wireless Operator and Air Gunner. Henryk Franciszek Sikorski, 780349, Sgt/Plutonowy had that also, but that Henryk Sikorski was the actual Radio Operator in the crew. 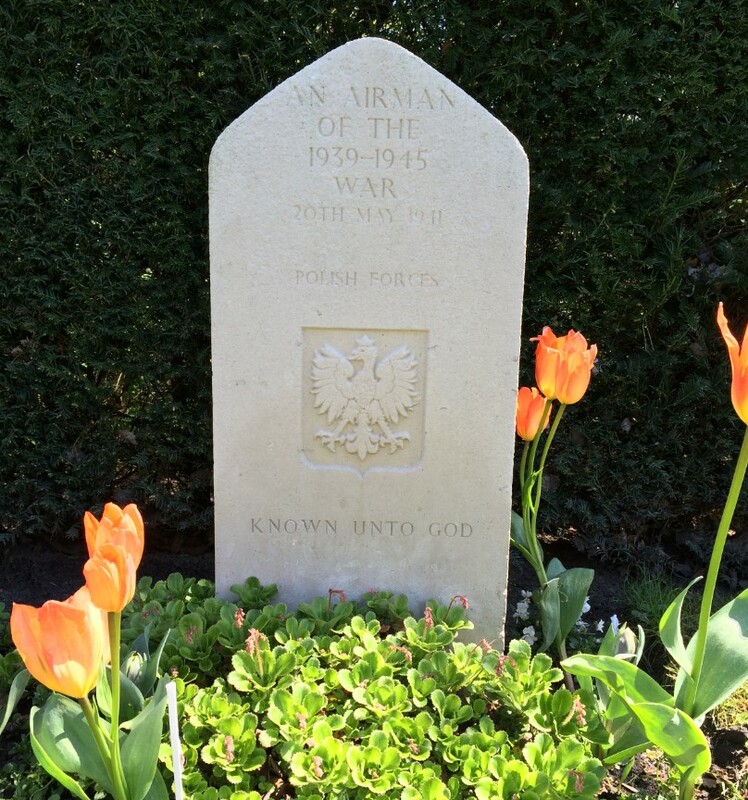 That confirms that unknown Polish front air gunner found in grave 69/E/21 in Amsterdam is Stanislaw Pisarski. Thank you Piotr. The sergeants in R1322 were classmates in 18 OTU (Photo Mr. Bialowas). Above 2nd right: Henryk Sikorski. Middle 2nd left: Stanislaw Pisarski. Below 1st left: Ludwik Karcz (thanks PATS). Replacement in Amsterdam of the Polish headstone on grave 69/E/21 for a headstone with name Pisarksi and burial of Sikorski and Socharski is not expected soon and can be some months away. Amsterdam is normally not an open cemetery for burial of airmen found, last burial there was 24 May 1945. However, there is a few meter free space right next to grave 69/E/21, towards the cross of sacrifice, which is ideal. The last burial of Polish airmen recovered from the Lake (five crew of Boguslaw Morski, Lancaster DV286, 12/13 June 1944, from Lake IJsselmeer at Wijdenes) was in 2003 in Breda Catholic Church followed by interment in the Breda Polish Field of Honour (Ettensebaan street). This is the cemetery where General Maczek rests. 2016, Dec 18. In memoriam S/Sgt. John "Jack" R. Lantz. 2016, Sept. 13. Fly-over the Wellington recovery location by the BBMF Lancaster planned Monday 19 September. Sunday 18 September Operation Market-Garden is commemorated. The BBMF (RAF's Battle of Britain Memorial Flight) Lancaster PA474 'KC-A' is in Eindhoven and over Arnhem-Oosterbeek. Monday 19 September the cofferdam in Lake IJsselmeer is visited as a salute to the crew of Wellington R1322. Estimated time of arrival (ETA) at nearby Oudemirdum village is 15:30h. We hope that PA474 can fly over the Frisian coastline here and salute the RAF airmen recovered from this lake shore and are buried in Lemmer, Nijemirdum, Bakhuizen, Scharl, Stavoren, Molkwerum, Koudum, Hindeloopen, Workum and Makkum. Lancaster at Oudemirdum (cofferdam is off shore, near boats). 1 minute, recommended, increase sound level! ): https://www.youtube.com/watch?v=Rm5K_9J1fW0 Thanks Kreidler & BBMF. 2016, Sept. 7th. 15:00h. Identity Wellington R1322 confirmed. Dutch air force announced this afternoon that a part with the aircrafts serial number R1322 was found. Also a headphone with name of one of the crew was recovered. This confirms it is Wellington R1322, Pilot Jan Dorman, RAF/PAF (Polish Air Force) 305 Squadron. Human remains have been found (bone fragments only) and brought over to the Dutch Army ID centre. It can take several weeks/months before anything about this is conclusive and if family members of the MIA can be informed. The bombs will be blown up on land in a location in eastern Netherlands. The cofferdam will be removed within 2 weeks. The fact that only bone fragments were found, supports our research (see link below) that only one or two of the crew can be inside the wreck, or as expected, all six crew washed ashore/were recovered in 1941. The bone fragments can be for example of a hand or other body part. Sources in 1941 reported the aircraft burned in the air after the attacks of the German nightfighter and fell from great height hard on the water. Alleen botfragmenten gevonden in Wellington R1322. Dit steunt ons eerder onderzoek dat nog 1 of 2 man in wrak aanwezig kan zijn, maar meer waarschijnlijker is (zie link onder) dat ze alle zes zijn aangespoeld/geborgen in 1941. De botfragmenten kunnen afkomstig zijn van b.v. een achtergebleven hand of ander lichaamsdeel. Bronnen uit 1941 meldden dat dit vliegtuig door beschieting van de Duitse nachtjager brandde en van grote hoogte in stukken op het water stortte. 2016, August 31. Recovery Wellington bomber IJsselmeer. Results, first (armed) bombs found. Also found were .303 cal. Browning machineguns and a Smith & Wesson revolver in good condition. No human remains found so far. The wreck is not identified yet, but the revolver is a good indication it can be Wellington R1322 with Polish crew. RAF flying personnel were forbidden to carry side arms, but the Poles took no chances with the Germans in case they came down in enemy territory. It is said that a Lancaster bomber will do a fly-over over the location as a tribute to the KIA crew. Below photo shows the four 500 lbs bombs (227kg) waiting for disarmament and a Dutch 'BIDKL' soldier (identification unit) in the cofferdam-pit, struggling with old fishing nets that are wrapped over the wreck. The bomb tail stabilization fins were made of thin metal and have rusted away completely. The above photos in the link show also British soldiers working in the pit. The cylinder heads are clearly belonging to a Bristol Pegasus engine, confirming the underwater reconnaissance that involved is a Wellington Mk IC. 2016, August 27. Recovery Wellington in progress. Lemmer. In last weeks water was pumped out of the cofferdam (almost 4 million liter). Monday 29 August the careful excavation will commence. According to the officer in charge of the salvage operation, Dutch Airforce Major A.L. (Arie) Kappert, the Wellington wreck consists out of smashed apart pieces, mostly covered with sand. If human remains will be found, they will be transferred to the Dutch Army Identification Centre 'BIDKL' in Soesterberg (Bergings- & Identification Dienst Koninklijke Landmacht). The location on sea is guarded by the local scouting club as a training. They are stationed next to the cofferdam onboard an old minesweeper, the W806. See for photos and video underneath link to website of Dutch TV. In their article is mentioned that there are still 63 aircraft wrecks in Lake IJsselmeer. 2016, June 17. Recovery announced of Wellington bomber (R1322?) in Lake IJsselmeer, starting 22 August 2016. Lemmer. The Dutch Airforce and Community Friese Meren (Gaasterland-Lemmer-Joure) announced to start 08/2016 to clear the wreck location of a WW2 RAF Wellington bomber. A steel sheet pile cofferdam (25 x 36 meter) will be erected around the wrecksite after which the water will be pumped out, see recovery plan. Water depth is 4 meters. It is the 2nd time a cofferdam is build around a wreck to recover it. First was B-24 42-7638 Oostvaardersplassen 1975. The work will take 4 weeks and will cost 1 million Euro (30% for the Community, 70% Dutch State). Most budget is for civilian contracter Leemans who is hired-in for the job, in close cooperation with specialists of the Netherlands Armed Forces. Expected to be found are at least two bombs and possible human remains. In this part of the Lake the seafloor is sand and of good quality for construction. In 2014 a Dutch mining-company gained a contract to excavate this sand in an area of 2,5 x 2,5 km x 30-80 meters deep. During a survey of the seabed the wreck items were discovered & reported. Location is situated 5,5 km south of the dyke at village Rijs ('R' on below map) and 15km SW of Lemmer. In 1961 a complete German Ju-88 was recovered here also. Which Wellington is involved is not certain yet, but it is an early type Mark IC (with Bristol Pegasus engines). It could be R1440, crew Pilot Officer Thomas Fairhurst (09/10 April 1941 'off Stavoren') with five MIA. Or N2844 Sgt. Kenneth C. Shearing (18/19 August 1941, with MIA). Most likely candidate however is Wellington Mk IC R1322 of 305 Squadron (Polish) fuselage code SM-F, pilot Flight Sgt. (Sierz. pil.) Jan Piotr Dorman. Three, possible five crew of Dorman's R1322 were recovered here from the water in July 1941 and buried in Urk (Karcz) and Amsterdam. A 6th man is unaccounted for (MIA). R1322 took off night 8/9 May 1941 from RAF Syerston airfield near Nottingham and was on route to Bremen. German nightfighter pilot Oberfeldwebel Hans Rasper (4./Nachtjagergeschwader 1) reported to have shot down that night a Wellington bomber 12km southwest of Lemmer ('L'), which is near current recovery location. If it is Dorman's Wellington R1322, than involved is a quite well-known aircraft in our region, because crewmember Corporal Ludwik Karcz washed ashore on the nearby Northeast Polder dyke (at 'K'). He was buried with full honour by the Urk community as 2nd Allied airman there on 2 July 1941. He was one of the two airmen under 'the Monument', his name engraved right-under at the base. After the Germans had Dorman's body, they (mis)used his identity to spy on other RAF airmen that were wounded (POW) and hospitalized in Amsterdam Luftwaffe Hospital. Links on the above, read more: Recovery plan Wellington August 2016. First dam around aircraft: B-24 42-7638 Oostvaaardersplassen 1975. File Urk war graves 1940-1945. Our file on the Amsterdam war burials 1941 July-Dec (Dorman and crew R1322). Other news articles June 17 2016: Jouster Courant and Community Friese Meren. Lemmer 17 juni 2016. De Bergingsdienst van de NL Luchtmacht o.l.v. Staf Officier Vliegtuig Berging Majoor A. Kappert en de Gemeente Friese Meren (Gaasterland-Lemmer-Joure) maakten bekend in augustus 2016 te starten met het ruimen van een vliegtuigwraklocatie uit de 2de Wereldoorlog, het betreft resten van een RAF Wellington bommenwerper. Een stalen damwand (25 x 36 meter) wordt geslagen rondom de wrakstuken waarna het water wordt weggepompt. ZZairwar: de waterdiepte is 4 meter. Het is de tweede keer dat een damwand wordt gebruikt om een vliegtuig te bergen. De eerste keer was in 1975 bij de berging van de B-24 in de Oostvaardersplassen. Het werk begint 22 augustus en zal vier weken duren. Kosten bedragen 1 miljoen Euro. 30% voor de gemeente en 70% het Rijk. Het grootste deel van het budget gaat naar aannemer Leemans die hiervoor is ingehuurd, in samenwerking en onder toezicht van specialisten van Defensie. Verwacht wordt twee of meer bommen te vinden en mogelijk menselijke resten. De IJsselmeerbodem bestaat hier uit zand dat erg geschikt is voor met name wegenbouw. In 2014 verkreeg een bedrijf vergunning om dit zand te winnen in een gebied van 2,5 x 2,5 km tot een diepte van 30 tot 80 meter. In het vooronderzoek (bodemscan) werden de vliegtuigwrakdelen aangetroffen en gerapporteerd. De wrakdelen liggen op 5,5 km zuidelijk van de Friese kust onder Rijs (Riis) en 15km ZW van Lemmer. In 1961 werd hier al een complete Duitse JU-88 geborgen. Om welke Wellington het gaat is nog niet bekend, maar het is een vroeg model IC met Bristol Pegasus motoren. Het zou de R1440 kunnen zijn, crew Pilot Officer Thomas Fairhurst (neer 09/10 April 1941 niet ver van Stavoren) met nog vijf vermisten. Maar het meest waarschijnlijk is Wellington type IC, serienummer R1322, romp- en radio code SM-F van het 305 squadron, een Pools sqn. binnen de RAF. Pilot was Sgt. Jan Piotr Dorman. Drie en mogelijk vijf bemanningsleden van dit vliegtuig werden later uit deze omgeving uit het water gehaald en begraven op Urk (Karcz) en in Amsterdam. Eén man is nooit gevonden en vermist. De R1322 vertrok in de nacht van 08/09 Mei 1941 van het RAF vliegveld Syerston bij Nottingham voor een missie op Bremen. De Duitse nachtjagerpiloot Oberfeldwebel Hans Rasper (4./Nachtjagergeschwader 1) meldde die nacht een Wellington te hebben neergeschoten 12km ten zuidwesten van Lemmer, in de buurt van de huidige wraklocatie. Als het inderdaad om Dorman's R1322 gaat, dan betreft dit een bekend vliegtuig in de IJsselmeer-regio. Bemanningslid korporaal Ludwik Karcz spoelde aan op de Noordoostpolderdijk ten noorden van Urk. Hij werd op 2 Juli 1941 begraven op Urk waarbij het hele dorp uitliep om de laatste eer te bewijzen. Hij en de RAF airman voor hem werden begraven in één graf (boven elkaar) en kregen een paar maanden daarna een waardig, voor Urker begrippen uitzonderlijk grafmonument (katholiek uitziend, Karcz was katholiek). De naam KORCZ (later gewijzigd in KARCZ) staat rechtsonder op de steen. Nadat de Duitsers Dorman's lichaam in handen hadden, werd z'n identiteit gebruikt om te spioneren op gevangengenomen gewonde Engelse vliegers in het Amsterdamse Wilhelmina Gasthuis. 2016, May 01. The Dutch National Broadcast Organization NOS reported on its news channels that still 1085 Allied airmen can be expected in aircraft wrecks in the Netherlands, in the ground or (most) under water. After the war these locations were not cleared. In total there are 501 such locations. Dutch communities as Almere, Makkum, Sudwest-Friesland and Echt-Susteren did turn down family-requests for recovery because of the financial coasts (500-800 K), no urgency or the fact that these locations have a monument on them and are considered as honorable field grave. Furthermore it is (ZZAW: correctly) argumented by them that it is not certain that remains are inside because crew can have jumped over water and can be lost on sea or washed ashore and buried somewhere as unknown Allied airman. Also many aircraft exploded with such force (bomb load) that human remains are not found back. In total 5000 aircraft came down in the Netherlands during WW2. American and Australian governmental organizations are trying actively to trace missing countrymen from that period. The British government supports the policy of considering the wrecks as field graves and leaving them in peace. However, many landowners did a survey on a wreck and wrecks were often excavated by historical societies. Today recoveries are always led by the Dutch Airforce Recovery Officer. Since 1960, nearly 200 aircraft wrecks were recovered from ground/water by the Dutch Airforce. The NOS added a disclaimer that its figures are based on data of others and aircraft could be included that already were salvaged by the German Army in 1940-1945 and period 1945-1960. Aircraft that came down in the North Sea were not included in the survey. More than half of the missing aircraft surveyed are in not accurately known positions in water: Wadden Sea, Lake IJsselmeer (Old Zuyder Sea) and Wester-Scheldt estuary. The 1085 airmen are 247 Germans, 228 Americans and some 600 flyers in service of the RAF. 2016, Apr. 22. Former Dutch Airforce recovery officer Gerrit J. Zwanenburg passed away Friday 22 April after a short stay in hospital, age 88. He took part in more than 100 aircraft wreck recoveries in the period 1962 - 1987. He professionalized aircraft identification in the Netherlands and build-up an excellent network with other airforces, veterans, research organizations and relatives of Allied airmen. For his work he was knighted into the Dutch Royal Order of Orange Nassau and was awarded the title MBE (Member of the British Empire). Gerrit Zwanenburg (1928) interest for Allied warplanes started in WW2, when as a boy he witnessed the airwar passing over his hometown Harlingen. He volunteered the Dutch Royal Marines in Indonesia in 1947-1948. In 1950 he worked as radio traffic annalist in the Military Intelligence Service (MID) in Amsterdam (Kattenburg). In 1962 he visited there the site of recovery of Lancaster R5512, crashed and drove deep in the ground night 20 December 1942 (pilot W.N. Eades). This was in the Volewijkers Park in Amsterdam-north. He had with him his private files on this aircraft, which were very welcome at that time. The Dutch Airforce Recovery Unit kept in contact with him. In 1967 Mr. Zwanenburg transferred from the MID to the Dutch Airforce and became member of the Recovery team. In 1970 he was appointed project-leader (Recovery Officer). After retirement in 1987, he researched the airwar over the Netherlands further and wrote several publications on this subject. 2016, Apr. 11. Website updated to new Joomla version. Test phase completed, site online. Some older pages can show excessive white spaces, this will be adjusted. 2015, Sept. Adobe Flash map on Homepage is not longer supported and viewable on Android phones and tablets, as Apple iPhone or iPad and browser Mozilla Firefox. The map will be replaced by a HTML-version in 2016, which will make it function again. Until then, this website is best viewed, incl. the map on homepage, on a desktop or laptop PC, with browser Google Chrome or Internet Explorer, minimum 13" (12,9") wide screen 16:9 ratio, 1920 x 1080 pixels. Also suitable for 10" and 12"-up tablets. Change over to HTML map on Homepage completed October 5th, 2016. 2015, Oct. 200 files of aircraft crashed in Lake IJsselmeer-area 1940-1945 updated and uploaded on this website. The next batch of 200 aircraft files will be uploaded summer 2016. While fishing on the central North Sea, this 4000 lbs HC (High Capacity) "Cookie" bomb was fished up. It lay in the middle of the line North Yorkshire - Hamburg. Probably an aircraft had to return to base and dumped its dangerous cargo into the North Sea before landing on the home base, an unknown airfield between Newcastle upon Tyne and York. For a thin wall ordnance, this very heavy bomb with 1814 kg high explosive was in excellent condition after laying in salt seawater for 72 years. The bomb has been lowered again to the sea floor and will be/or is demolished by now. Source article: Visserijnieuws 15 August 2015. 2015, Aug. 150 cemetery files uploaded on the website. Research conducted on all (150) cemetery with war graves that could have yes or no a relation with airwar over Lake IJsselmeer. All non-identified airmen buried around the Lake as 'Known to God' were registered and entered in the database in SEARCH MENU at Buried as unknown. 2015, Feb. Website online in test phase with limited content to test database functions. 2013, Nov. Study completed on the original WW2 burial files Amsterdam New Eastern Cemetery. Amsterdam has the largest airwar-cemetery in Netherlands, end WW2 330 casualties interred. 50 men non-identified today, all washed ashore Lake IJsselmeer (Old Zuyder Sea) or North Sea beach at Zandvoort. Article homepage http://www.zzairwar.nl/ menu left 'The Amsterdam War Graves'. 2011, Jan. Start design of website. Goal is to bring on the internet the collected Lake IJsselmeer (Old Zuyder Sea) airwar data in a organized format for research purposes, also usable for non-airwar researchers and relatives of (missing) airmen. 2006, Dec. Database (MS Access) completed with aircraft crashed in Lake IJsselmeer (Old Zuyder Sea). Data based as much as possible on original files, 1940-1945 local burial files, oral and written regional history, fishermen interviews, Dutch Military recoveries 1945-1985, Dutch WW2 police records, German and Allied files. 2005, May. Assisted in identification in Lake IJsselmeer (IJmeer) a location with BMW-engines. This proved wreckage of Luftwaffe Heinkel 115 B seaplane, no. 2732, crashed in Lake 13 June 1940. No MIA. Engines to museum. 1999, Sep. Assisted in identification of aircraft wreck Lake IJsselmeer (north). Proved Halifax II, W1217, 10 Sqn, pilot C. Hine. Crashed in Lake night 23/24 May 1943. Crew washed ashore, no MIA. 1998, Sep. Assisted in identification of an aircraft wreck in Lake IJsselmeer (off Wijdenes). This was Lancaster III, DV286, RAF 300 Sqn (Polish), crashed in Lake night 12/13 June 1944. Reported to authorities. Recovery procedure completed 2002 by Dutch Military. Remains of five MIA crew found, buried with military honour Polish Field of Honour in Breda, October 2003. 1996, Apr. Assisted in identification of an aircraft wreck in northern Lake IJsselmeer, found by fishing boat VD64 (Volendam 64, Schilder Brothers). Reported to the authorities. Thanks to a retrieved engine number, this aircraft proved to be Lancaster III, ED603, 83 Sqn. Crashed in Lake night 12/13 June 1943, with elite Pathfinder crew. Engine to museum. Possible three MIA crew members inside fuselage behind cockpit. Recovery procedure by Dutch Government pending. Onboard diving equipment on VD64 was used to release a fishing net that was entangled with the wreck that prevented the fishing boat to sail on. A Rolls Royce Merlin 28 engine was winched-up to copy the the serial plate. Photo camera not on board, drawing made of that plate. Model was build to demonstrate belly-up position and (excellent) condition of this Lancaster, even a bomb-bay door is present, intact and stands half open. Scale of the aircraft under water is huge, a diver is smaller than visible tyre.